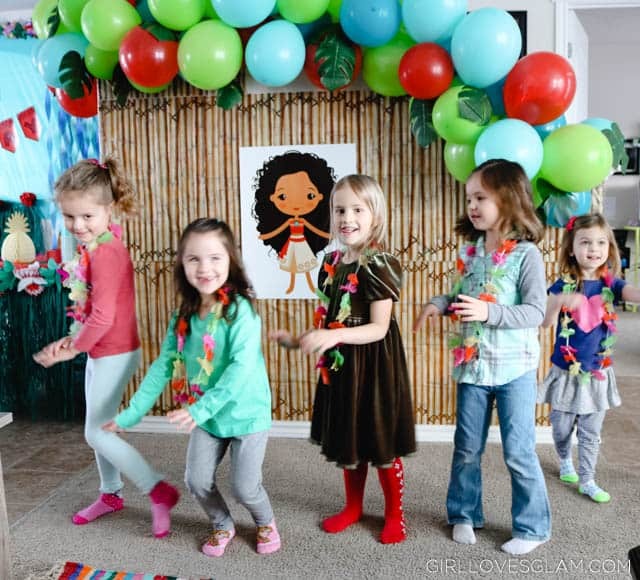 My daughter’s Moana birthday party luau was such a fun party to plan! 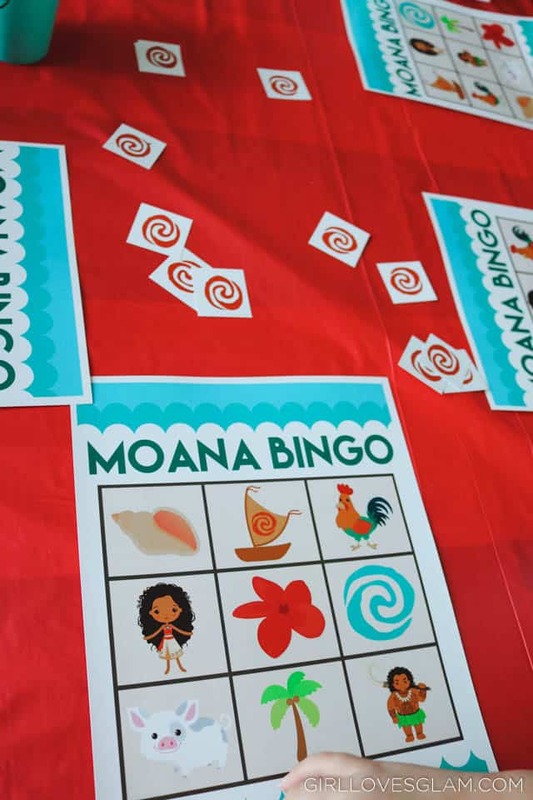 It was fun to be able to plan activities that were character themed, but also plan luau activities that would be new to a group of 5 year olds! As the guests arrived, we had the Moana soundtrack playing to get everyone excited. We gave each of them flower leis and started to teach them how to hula dance until all of the guests arrived. 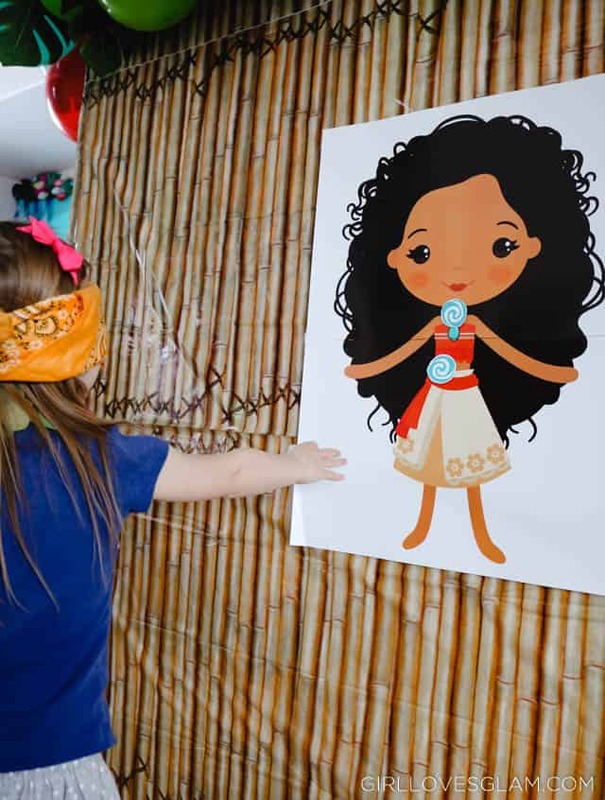 After everyone arrived, we played pin the necklace on Moana. For kids this young, we just blindfolded them instead of blindfolding and spinning them. We had a few that obviously saw through the blindfold, but it made it even more entertaining to watch them pretend not to be able to see and put it right where her necklace should go! I was able to get this image as part of an image pack from Araqua on Etsy for $5. These images are great for this game, any other games you want to create, party decor, and for making your own invitations! You don’t even need to be a Photoshop wizard to use these images. You can use PicMonkey and be able to look like you are a professional graphic designer! 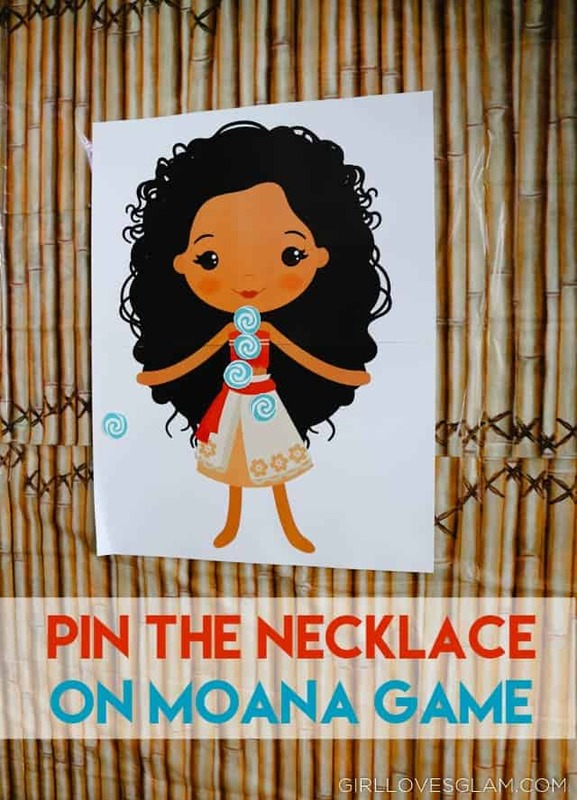 To create the Pin the Necklace on Moana game, I took the PNG files I had purchased and went to a local printing shop to have them blow the image up large enough for the game. They also were able to make the swirls for her necklace the right size so they would be relatively close to scale with Moana’s body. After that, the party guests all ate cupcakes and our island goodies that we had for them. 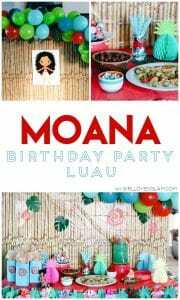 You can see the details of what we served and all of the decor in my other Moana Birthday Party post. 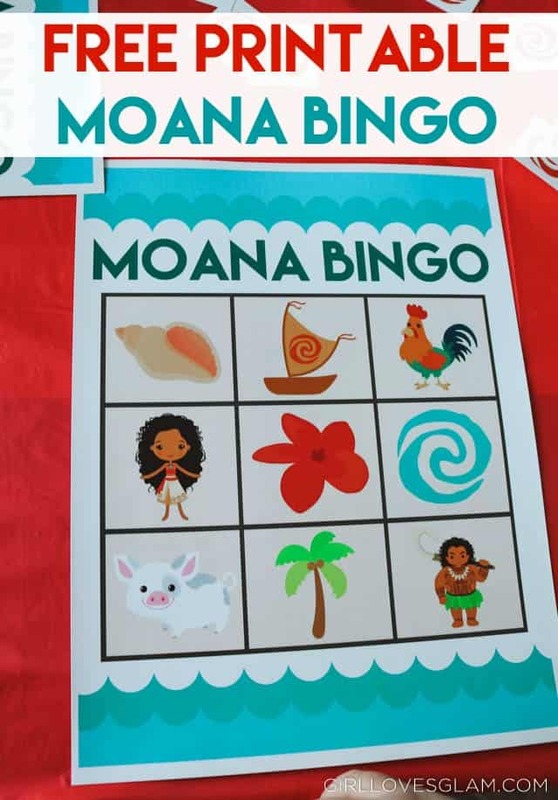 While we were still at the table, we played Moana Bingo. It was the first time that many of them had played bingo, so we played several rounds of it! I created these bingo sheets with the images that I purchased and was given permission to be able to share this game as a free printable with all of you! You can download the bingo sheets, cards, and playing chips below. After bingo, we did a fun tissue paper craft. I love having some sort of hands on activity like this at birthday parties. It takes up a good chunk of time and it gives the kids the opportunity to be creative with their friends! All you do is cut up lots of little pieces of tissue paper and let the kids glue them to the picture. It works best if you bunch up the tissue paper as you do it, but some kids just wanted to glue the tissue paper on in the squares. That is part of the fun! Everyone’s pictures turn out differently! 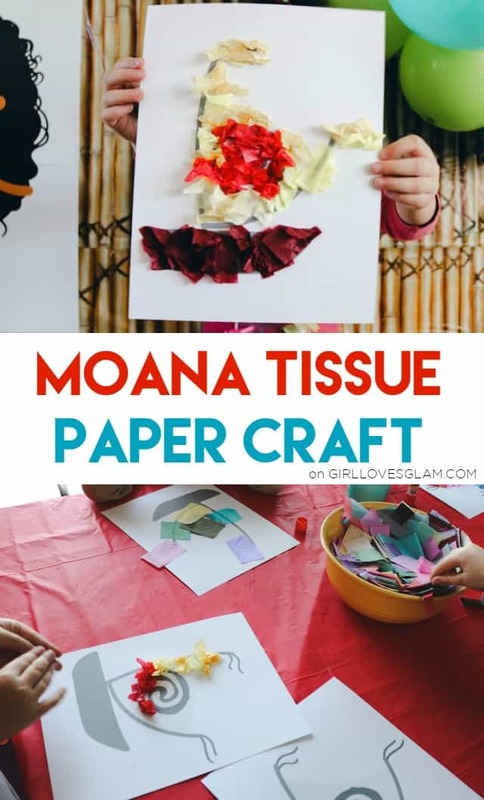 You can download your own Moana boat picture to do this craft too by visiting the link below. After the craft, we did a pinata. That was the one thing that my daughter wanted to do more than anything else at her party. 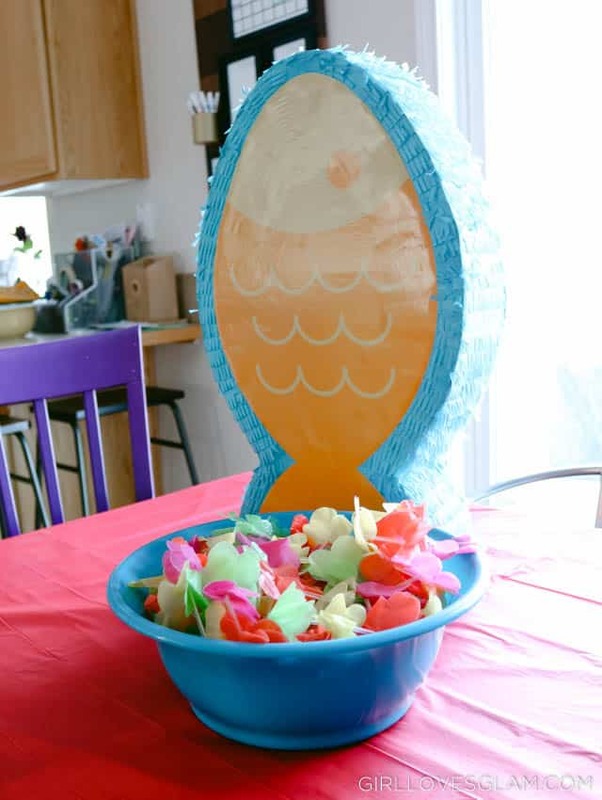 I found this cute fish pinata online, but wish I would have looked on Amazon because there are tons of fish pinatas for less than what I paid for this one. Then we used the pinata stick to play limbo. Limbo is a funny game to play with a bunch of 4-5 year old kids. There isn’t a lot of bending over backwards and more just crawling under the stick. They all loved it though! To finish the party off, we gave them all their goodie bags, let them load up on candy from our serving table, and they played with the bubbles that were in their bags until they were picked up from the party. Overall, the party was a huge success! We all had a great time. I love the opportunity to throw fun parties like this because my mom always threw great parties as I was growing up! You can find all of the decor and food details of our Moana party on yesterday’s post which is linked below! 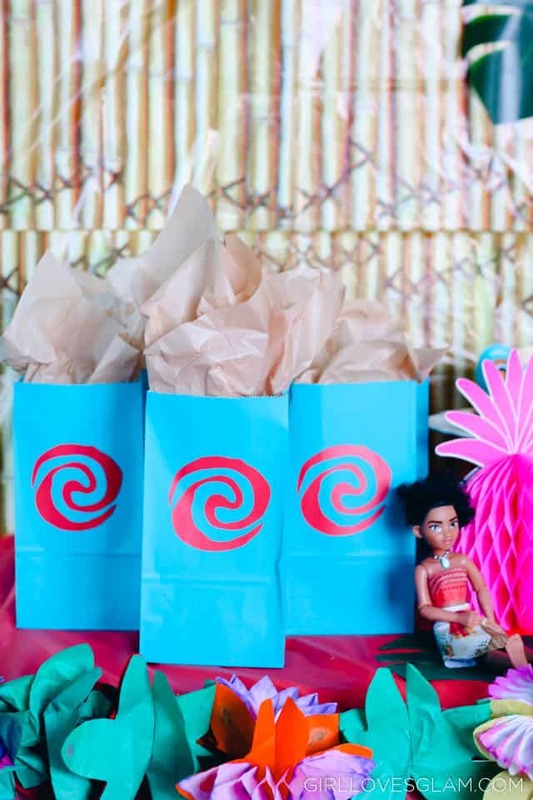 Do you have someone who would love to have a Moana party? CAN I ask how you play the bingo game and also I have 12 girls coming to my daughter birthday – do you have any more bingo cards than the 8 posted? We played until everyone won prizes, so if you do the same thing, I would just print off enough of the same cards for everyone and you will have a few girls who win at the same time. I’ve been trying to download the Moana pin the necklace game but it keeps asking me to add an extension to chrome then when I go through all the options it never brings me to the download page. It is just in a Google Doc. I am sure the Chrome extension is just for Google Docs. I don’t even see a link to the necklace game. Am I crazy?! Love your ideas! Would you share what fonts you used in your invitation? I’m going to buy the clip art pack from Etsy but curious as to the font. Thanks!! It is called Lemon Milk! Thank you so much!!!! 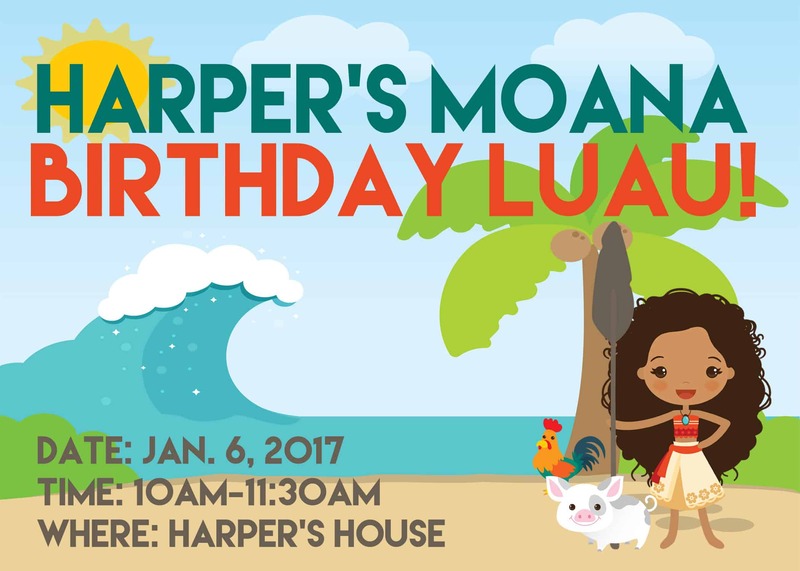 This blog has been very helpful in planning my daughter’s Moana party. Thanks for all of the details and Amazon links.